Need Immediate Cooling or Heating Repair? How fast can you fix my AC / Furnace / Heat Pump? We try to get to your location immediately whenever possible. The average wait time is 2 hours when temperatures aren't extreme (<32° F or >95° F). When the temperatures are extreme, calls are handled first come first serve. AirPlus Service Club Members enjoy get priority service any time of year. Call to join now! 80% of the time a thermostat isn't the problem with a cooling or heating unit. Thermostats do go bad, but normally there are underlying issues that need to be addressed beyond the thermostat. Frozen systems require immediate attention by a trained HVAC technician. Air Conditioners low on freon will cause the refrigerant temperature inside the evaporator coil to drop below freezing causing water on the coil to freeze into a block of ice. Frozen systems will not cool properly and may cause water damage. 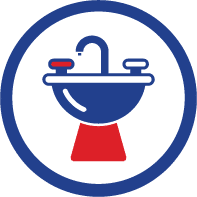 Clogged drains can lead to serious water damage in your home and require immediate attention by a trained HVAC technician. A clogged drain can be a major expense if not handled immediately. The water could spill over the pan and depending on where unit is located may damage your ceiling, walls and floors. Both problems above should be immediately addressed to avoid damaging your system and possibly your home. Do you have a burning smell in the house? Call 911 and an HVAC technician immediately! This could be a motor, dirt on the electric heating elements, or something in the furnace. In any of these situations a professional should be called immediately to check the problem. Don't sit in the house with 4 layers of clothes on to keep warm. Call AirPlus and we'll take care of you right away. Why is water leaking from my furnace or AC? This could be from a clogged condensate, floor drain, or a humidifier if one is attached. Often times humidifiers are over looked and not serviced annually. This can cause the evaporative panel to become clogged and leak. Water heaters are also a prime suspect as they are typically sitting next to the furnace and can leak as well. Water leaks in utility rooms and attics can cause major damage to your home. Contact an HVAC Professional to address leak issues immediately! In the event of a water leak a professional should be contacted to diagnose and resolve the problem. Water leaks are a major source for property damage and insurance claims.